Her awards include the Pastel Journal Pastel 100, 2001 and 2002 and 2005; and Best of Show, American Impressionist Society, Taos, New Mexico 2005. She is represented by the Fountainside Fine Art Gallery, Wilmington, North Carolina; Studio b. Gallery; and through her studio in the historic Fine Arts Building, Chicago. Her work is held in many private collections throughout the country as well as by Northwestern’s Prentice Hall, the Ritz-Carlton Orlando; Ritz-Carlton Destination Club, Jupiter, Florida; AT&T, IBM, MCI, Disney, Deloitte and the American Dental Association. Her work has been included in Best of Portraits, Northlight Books, 1998, and in The Chicago Art Scene, CrowWoods Publishing. Subjects: Landscape; Seascape. I have rarely come upon a pastel artist with such a portfolio of paintings about sailing. Navigation: A typical FineArtStudioOnLine site. This means that some of the links are generic and do not function if there is no content within (the Archive link is a case in point, but Plein Air, and Portrait are also empty). Main Menu remains available and the galleries are easy to navigate. Gallery: Paintings: There are thirteen painting collections, and one on available prints. I don’t need to list them all, but do see China, and Venice - and don’t miss the one on sailing. 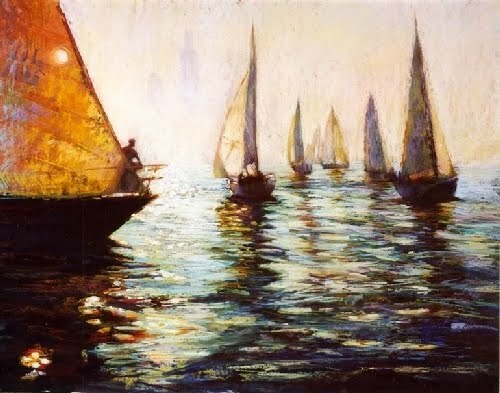 What with the travelling, the sailing, rowing, and medical school images, I suspect that Kathleen’s art closely documents life experiences. Image View: Each gallery opens in a page of thumbnails that contain information on medium and dimension. Click to enlarge; click again to further enlarge. Download is possible. Starting Line is 22 x 28 ins, 500 x 393, 186 KB.